Visite las impresionantes ruinas mayas de Chichén Itzá en esta asequible visita guiada de todo el día. Aproveche al máximo el tiempo limitado con la cómoda recogida en un autobús de lujo. Deje que un guía profesional enriquezca su experiencia explicando la convincente historia de Yucatán. 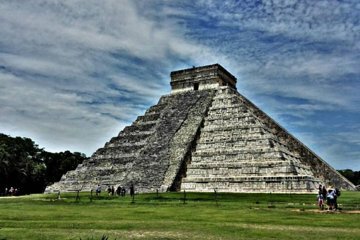 Explore las pirámides y templos de las extensas ruinas mientras aprende sobre sus leyendas y secretos. Termine la excursión con un baño en una piscina subterránea llamada cenote. Conozca la fascinante historia del sitio con una guía informativa. Nobody showed up at 7am! We had the front desk call the local contact atus tour and somehow they said the pick up is going to be in Tulum even though it clearly stated we will be picked up at the hotel in Akumal Bay. Then the story changed and said oh maybe at 9am... definitely not recommending! Very good value for money tour. Our guide was very knowledgeable, giving us lots of interesting facts about The Mayans. The buffet lunch included in the tour was really tasty. I would recommend you take your own bottles of water or money to buy drinks as the tour did not include any. It does say it includes 2bottles! Chichen Itzá is well worth a visit, although it would have been unbearable on a very hot day as there is little shade! Amazing tour. Very professional, I couldn't fault the guides who were knowledgeable friendly and helpful. I have to single out Adrian who not only entertained us on the journey but also as the guide for the English speaking group during the Chichen itza part of the tour certainly knew his stuff. Would definitely recommend this tour.